I guess by now you all know I jump from one project to another. Well today I was so tired of hunting for things in the sewing room I thought I would get started on this BIG JOB of organizing. I'll be showing pictures of everyday progress, at least one drawer, one shelf or just one piece of fabric folded, it's a step. Hope to give some ideas on storage and using what we have. Maybe by Christmas you can see the whole sewing room. LOL. If anyone wants to join in I'll put a list on the sidebar with the button. You can add the button to your blog so every time you look at it you'll have to put away something. Maybe we can encourage each other to keep it organized. The picture above is not how it will look, but I wanted to show you the jars I'm loading up. You don't have to have old antique jars. You can take a pickle jar and cut a piece of fabric to decorate the top of it. I know you have some fabric. If you look at the top of the armoire I took an extension curtain rod and loaded it up with ribbons. I like to wrap packages with them. You can also do this in the top of your closet. So here is a little button (at the top of the post) you can grab. If you are already on top of things you want need this, but I need a little shove. Love all your jars of goodies. I just cleaned and rearranged my sewing room too. The biggest mess is always the cutting table! Multiple amoires? I couldn't fit one in my sewing space...right now I can hardly walk in my sewing space. Time for tidying up! Like the extension rod idea! I have a crystal cookie jar full of buttons...well there is a wee bit of room for more. Nothing feels better than when you are all finished organizing! I love the jars. Have fun! I love the jars. They add so much charm to a sewing area. I have one with antique sewing notions stuffed into it. Fun stuff. I wish you well in your organizing endeavor. It looks great!! I have been purchasing a bunch of jars lately to put some of my treasures in. Thanks for sharing! 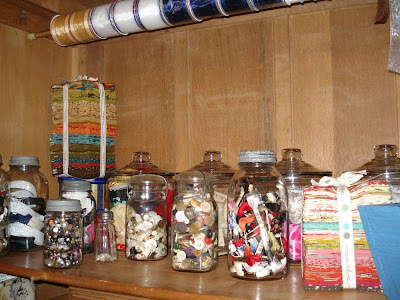 Excellent idea for ribbon storage! 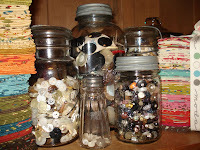 I have lots of mason jars filled with leftover binding, antique spools of thread, scrap ribbon pieces, buttons, selvedge ends and anything else that will fit in one. Not only do they look great, they make great organizers. Good luck with your mission Bonnie. You'll be a happy camper when it's done...trust me! Isn't having a clean room nice? Ready for another project. Thanks for sharing your storage ideas. I use jars myself. When you see this picture you will find a surprise giveaway! Oh my I won!!! Doesn't she look excited. Stop by and join the fun for giveaways from handmade items to supplies to add to your stash. Details on how to win given at each time of giveaway. Welcome to my online Web Site-Just click on the Cottage below to enter the shop! Nanette has a wonderful blog!!! Kim has the Greatest Inspiration's! Moto... Use some up... make room for more! Dana has a great blog!!! Jacquie is having a challenge!!! Just click on picture, it will take you to the tutorial! Apron to bring back memories! Click on picture, it will bring you to the tutorial! Donna Rohde has started a social network-It's Great Go Check it out and watch it grow! Biz Bodies.... Grand Opening Week! This is a Flickr badge showing public photos and videos from calamity janes cottage. Make your own badge here. When entering the welcoming warmth of my grandmother's home, her quilt frame had to be moved away from the front door to make room for family and friends to gather. With this in mind, the door is always opened to welcome you. I have been married to my best friend for 35 years. We have been together since the 7th grade, which at that time I came home and told my Mom who I was going to marry. She just laughed. We have 2 children, a son and a daughter, who is married. We feel her husband is one of ours and they gave us three of the grandest grandkids anyone could ask for. I love to be creative in all areas, but love to make something out of finds from estate sales to flea markets (trash to treasure). I'll be taking pictures of before and after shots and instructions on how some of the items are made. Sewing is my relaxing hobby. I started in the 5th grade summer. I know all of us who are creative have big dreams and I hope all of yours come true. Are you ready for some MESS!!! Proud MiMi has to show some pictures!!! Just a little peek of the SPRING GIVEAWAY!!! I am blessed to have received so many tags/awards in the past. I feel bad when I cannot do them all justice and hate the thought of some friends feeling left out when they are not chosen. All my blogging friends are special and important to me, so therefore, I request to remain tag/award free. Please remember that all photos, artwork and text are my original property, unless otherwise noted. Please do not copy, use or reprint my blog writing or photos without written permission. Thank you.